$7 billion out-of-balance budget passed by House Democrats. 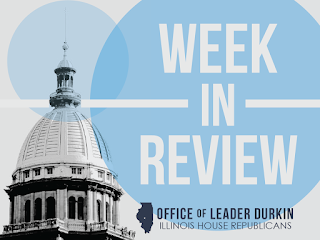 Illinois House Democrats introduced their own “budget” for FY17, contained in House Floor Amendment #2 to SB 2048, undermining the work of the bipartisan budget working groups that had been making progress toward achieving a compromise to end the budget impasse. The House Democrats’ budget weighs in at approximately $40 billion in spending with only $33 billion in estimated revenue. The Democrats unbalanced, unconstitutional proposed budget is $7 billion out-of-balance and would require a 47% tax hike to pay for all the additional spending. House Republicans were denied a vote verification for a 500-page bill that was introduced a mere 90-minutes before it was called for debate on the House Floor. Democrats then limited the debate to less than an hour with a parliamentarian move. The first vote on Wednesday, May 25, was 63-53-1. There was a second vote on Thursday and the measure was passed again by a vote of 60-53-1. By spending at least $7 billion more than Illinois expects to take in during the spending period, the measure is seen as likely to raise the count of unpaid Illinois bills up to or above $15 billion. Illinois is already the lowest-ranked of the 50 states in terms of credit rating. The controversial measure was sent to the state Senate for further discussion and debate. Governor Rauner has pledged to take veto action on the SB 2048 “budget” bill, should it get to his desk. House Republicans stand up for Illinoisans. House Republicans took action on Friday, May 26, with only 4 days left in the spring legislative session, calling on all legislators in the House to literally “stand up” to show their willingness to stay at work over the weekend and continue bipartisan efforts to achieve compromise on a comprehensive, balanced budget. Rep. Mike Tryon reminded the body that the role of the minority is to challenge the majority and to keep them accountable. House Democrats instead chose to adjourn and leave town. There’s a few days left to get a deal done, and we need to continue to work towards a bipartisan compromise to our State’s budget impasse. Rank and file members have been participating in working groups aimed at bridging the gap and coming up with both reforms and budgetary compromises. Speaker Madigan continues to dismiss these saying they haven’t made progress. He’s wrong. They are making progress and their work needs to continue. We need to see this bipartisan effort through to completion. If allowed to continue, the progress made by the working groups can lead to a budget compromise negotiated and agreed to by both sides and reforms to grow the economy. This is what we need, what the people of Illinois want, and what we were sent here to do. Now is the time to come together and put the people of Illinois first. We owe it to every Illinois family and taxpayer to finish the job. Legislation passed to fight synthetic drug epidemic. Rep. Avery Bourne (R-Raymond) is the chief House sponsor of Senate Bill 210, which creates the Bath Salt Prohibition Act and provides for penalties for retailers who sell banned synthetic drugs. Working with local law enforcement, Bourne has sponsored three pieces of legislation during this session of the General Assembly to halt the proliferation of this dangerous drug. These synthetic drugs, classified as cathinones, more commonly known as “bath salts”, are highly intoxicating and unpredictable in their effects. These drugs are being sold under the disguise of bath salts, plant food, and jewelry cleaner and were technically legal until 2011. In 2011, in response to the increased synthetic drug epidemic nationwide, Rep. Wayne Rosenthal introduced HB 2089. This legislation placed a ban on certain ingredients in cathinones and provided law enforcement some leverage to crack down on this epidemic. Under this most recent proposal, SB 210, a retailer that is convicted of selling bath salts can have their retail license revoked, and guilty offenders can be charged with a Class 3 felony. After passing the Senate unanimously, Bourne passed SB 210 on a unanimous House vote earlier this week. "Our area and areas across the state are facing a growing epidemic with these drugs and have limited tools to battle it. While SB 210 is not a solution, this bi-partisan, common sense legislation is a good step towards helping our law enforcement crack down on these drugs,” said Bourne. Statewide home sales, prices accelerate. In line with nationwide real estate conditions, home sales and prices quickened in Illinois in April 2016. A report by the Illinois Realtors show year-over year sales moving up 8.2% in April, to 14,189 single-family units changing hands in the 2016 spring period. The statewide median price of a home increased 10.4% during the same twelve-month period, from $169,000 in April 2015 to $186,500 in April 2016. Industry professionals credited relatively reasonable mortgage interest rates and overall economic trends for the upward activity. During the 30-day period studied, the nationwide average rate for a 30-year fixed-rate mortgage was 3.60%. As in previous months, trends in greater Chicago led the movement in Illinois as a whole. The median price for a home that changed hands in metropolitan Chicago in April 2016 was $230,000, up from $208,000 one year earlier. Residential real estate movements were especially active in Kane County, which had been affected by the 2008-09 downturn. April 2015-April 2016 price trends showed an increase of 21.0% in the Chicago-area county and its far-western suburbs, to $215,000 for a median home. Major Downstate electric utility has signed favorable contracts for this summer. The announcement by Ameren Illinois signaled that electric rates to be paid by a typical household could stabilize significantly in summer 2016 as opposed to summer 2015. Summers usually see peak demands for electricity in Illinois, driven by air conditioning and other seasonal needs. A typical residence will consume approximately 10,000 kilowatt-hours of power monthly. The price stability was attributed by Ameren to reasonable rates for regional peak power. Peak power rates are determined, in much of Downstate Illinois, by auction rates set by the Midcontinent Independent System Operator (MISO), a consortium of electric-grid operators that oversee and balance demands for electric power throughout a large section of the Midwest. MISO power rates spiked upward in 2015, driving electric rates up for many Downstate households. Price of gasoline rises with approach of summer driving season. The motor fuel price data aggregator Gasbuddy.com tracked an increase in posted pump prices of 6.8 cents per gallon last week, to $2.41. Although prices in Illinois are almost half a dollar below the levels seen at this time last year, Illinois motor fuel prices once again topped the nationwide average. The $2.41 pump price for Illinois motor fuel last week was thirteen cents higher than the $2.28 national average for the same period. High Illinois motor and sales tax rates on motor fuel are blamed for much of the discrepancy. In addition to high tax rates, the pump prices paid by Illinois motorists for summertime motor fuel is sometimes affected by supply/demand situations caused by the unique blends of fuel that are required by federal law to be sold in greater Chicago and St. Louis. Both metropolitan areas are officially classified as “noncompliance” areas in relatively permanent violation of the federal Clean Air Act, partly because of persistent levels of ozone. The federal government requires Chicago and St. Louis-area motor fuel retailers to sell special blends of motor fuel that are supposed to reduce ozone emissions. New UIUC dual-degree program in engineering/entrepreneurship. Repeated questions have been asked in recent years on how to speed up the marketing of innovations derived from persons affiliated with Illinois’ public colleges and universities, especially the University of Illinois and Urbana-Champaign (UIUC). In response to these concerns, UIUC’s College Engineering announced this week that it is prepared to offer a new dual-degree program in Innovation, Leadership, and Engineering Entrepreneurship. 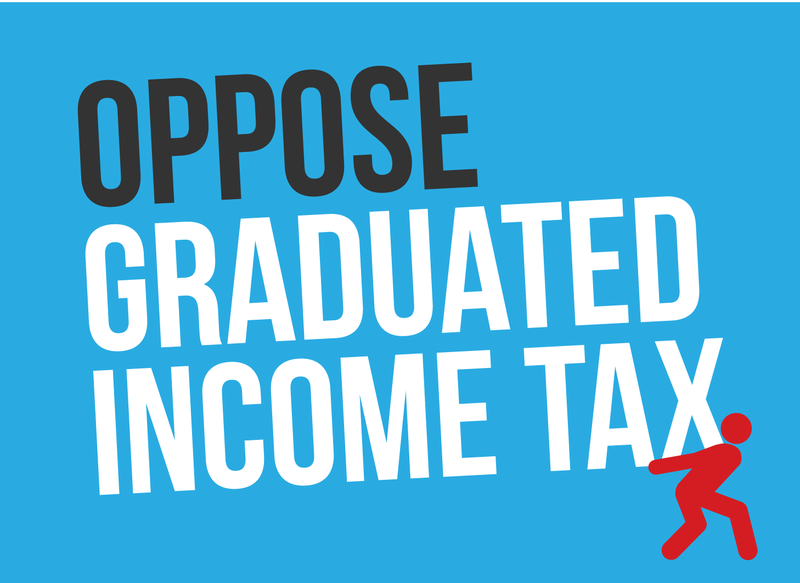 Implementation of the new program should begin in September with the approval of the Illinois Board of Higher Education. The program has already received the approval of the UIUC Board of Trustees. The new dual degree will be marketed to students with vocations in engineering, computer science, or physics who are looking for skills acquisition sufficient to start up a business and bring an innovation to market. More than 1,000 annual enrollments are already chalked up at the UIUC’s Technology Entrepreneurship Center (TEC), an incubator facility that matches potential entrepreneurs with potential mentors and contacts. House passes family leave bill; critics point to negative effect on Illinois job creation. Illinois has one of the highest unemployment rates in the United States (6.6% in April 2016). However, some advocates would like Illinois to become one of the states that mandates employers to offer what is called “family leave” to their employees. HB 6162, a major family leave bill of the spring 2016 session, was approved by the House this week. The bill would make personal sick leave days transferable, under some circumstances, when enumerated members of an employee’s family have medical challenges or require medical attention. HB 6162 was approved by a vote of 78-35-0 on Tuesday, May 24, and went to the Senate for further discussion and debate. House Republicans turn back attempt to derail collective bargaining process. HB 580 would have imposed mandatory arbitration on the current labor-management relations between the State of Illinois, represented by the Rauner Administration, on the one hand, and several state unions led by AFSCME on the other. While 17 unions and labor units have accepted contract offers with the State, AFSCME has refused to accept any of the offers made to it. Budget analysts say that compliance with the demands made by AFSCME and the minority of unions that are allied to it would create a budget hole of as much as $3 billion/year at the expense of taxpayers. 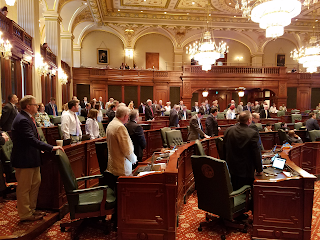 After being vetoed by Governor Bruce Rauner, the mandatory-arbitration measure was brought back to the House for a veto override vote. House Republicans opposed the measure, saying that it would impose a slanted process upon the outcome of labor-management negotiations. The attempt to override the Governor’s veto failed on Wednesday, May 25, on a vote of 69-47-1. This tally fell short of the three-fifths majority (71 votes) required to override a gubernatorial veto. House passes bill to keep Illinois drivers’ licenses OK for use in airports. The federal Department of Homeland Security has demanded that the 50 states take various actions to increase the security of their drivers’ licenses. States that fail to meet, or get closer to, the nationwide guidelines mandated by the federal REAL ID Act will no longer been seen as valid issuers of identification cards that will be approved for access to departure gates at airports, federal buildings, or bases used by the federal armed forces. With this reality in mind, House members this week debated and passed SB 637. 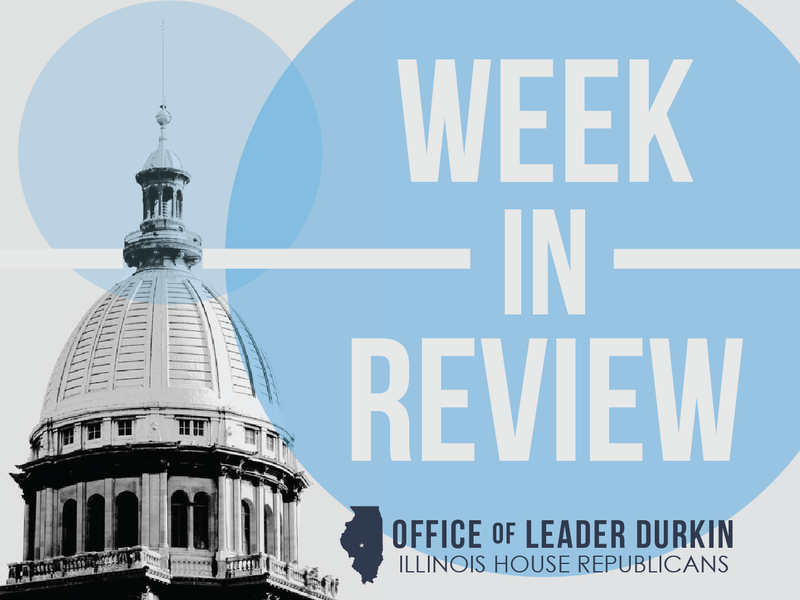 As amended by House Amendment #2, the measure draws a bright line between an Illinois drivers’ license and an Illinois official identification card, a separate document. 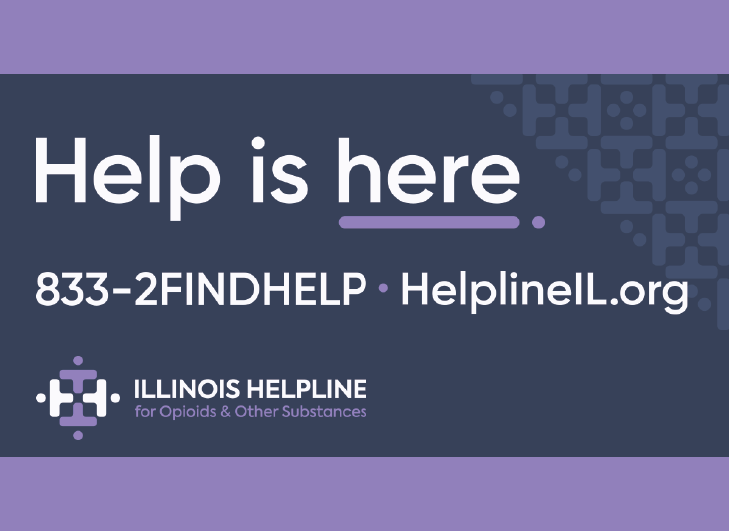 The measure requires that Illinois applicants for an identification card or a drivers’ license present proof of their lawful status in the United States. The bill provides that no Illinois resident shall be allowed to have a state ID card and a state driver’s license; dividing up the two ID cards, and separating those eligible for each one. As amended, HB 637 was sent back to the Senate for further discussion and debate. The House vote was 117-0-0. Travel experts estimate approximately 1.9 million to visit Illinois over Memorial Day. The AAA estimate, published on Thursday, May 26, included data from subgroup estimates by entities such as the Illinois Tollways and major U.S. airlines. Travelers expecting to pass through security at major U.S. airports were once again warned to allow plenty of time (2 to 3 hours are recommended) for security queues and checks. Spokespersons for law enforcement are projecting enhanced enforcement efforts aimed at seat-belt law violators and impaired driving.